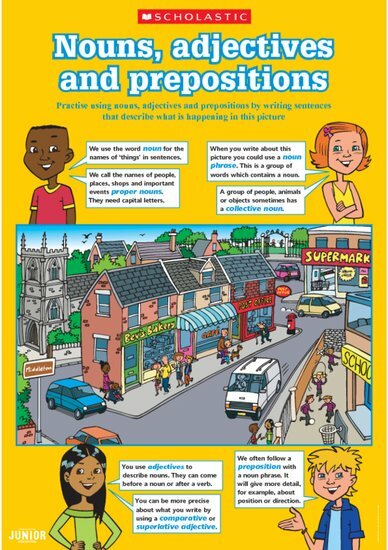 Display this colourful poster in your classroom and use it to help children get to grips with nouns, adjectives ands prepositions. They can practise by making up descriptive sentences that explain what is happening in the illustration, making sure that each of their sentences includes a noun, an adjective and a preposition. Primary members of the Scholastic Resource Bank can get instant access to this poster and thousands more online resources. Our finely crafted resources include lesson plans, teaching ideas, planning and assessment tools, activity sheets, interactives and video.